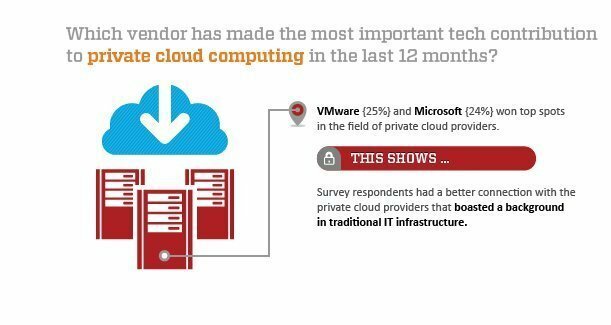 VMware and Microsoft won top spots in the field of private cloud providers, among Data Center & Readers' Choice 2013 survey respondents interested in cloud. But the virtualization giant VMware just barely edged out Microsoft, while Amazon, Citrix and IBM jostled for runners-up positions. A little more than 20% of the survey's respondents have private cloud implementations, with another 15.5% planning to deploy private cloud within 12 months. While Amazon has name recognition in the cloud computing market, it isn't known for supporting enterprise IT infrastructures, and respondents seemed more interested in the private cloud providers that boasted a background in traditional IT infrastructures. About one-quarter of respondents to the question said VMware was the technological leader for private cloud, with Microsoft garnering nearly as many votes (about 24% of respondents).